Thanks for all the great gifts. Thanks for the nice presents. I've finally been able to render the scene! Thank you again for the presents, very much appreciated. Here is my next render. I used the playground, flex flyer, and holiday hair. 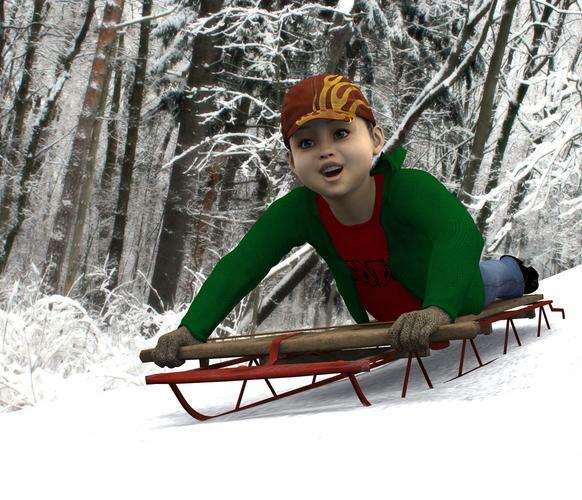 I used some motion blur to show him flying down the slide on the sled. 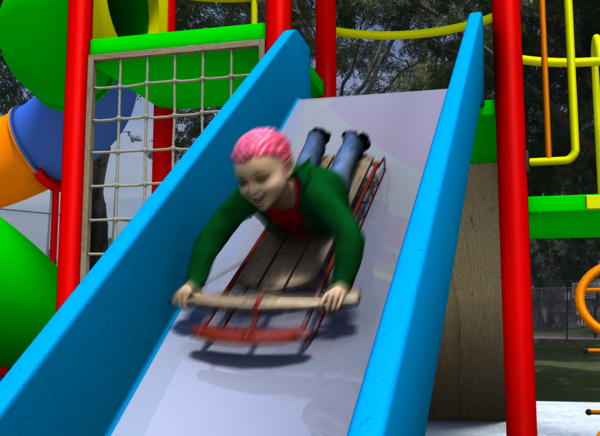 Here is the boy with holiday hair on the flex flyer in the playground with the tooncam. 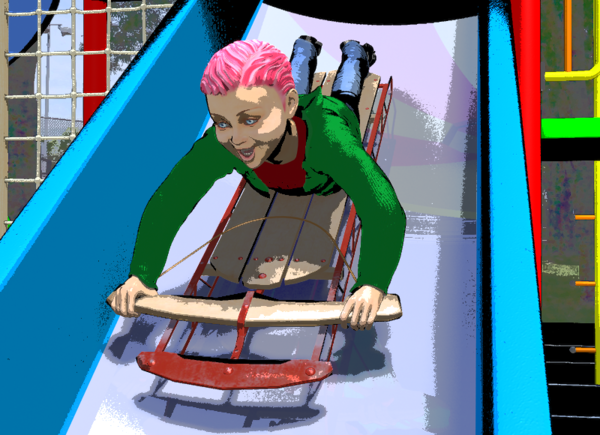 Question about tooncam - are we supposed to use the default or cartoon shader in the render settings with tooncam? 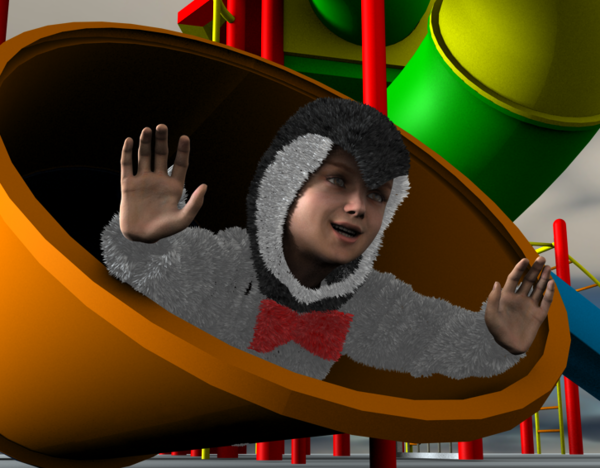 This render used cartoon. It gave better definition around his facial features. Thanks for the annual freebie bash! Happy New year to all the PA's and thank you for the cool presents this year! ...didn't get around to downloading these until yesterday. Very Very nice, Thank you all very much. First of all, I want to say Thank You to the DAZ company for all the sales they offered for the past few months..... and I want to thank all the vendors who were so generous in providing very decent sales to all of us. I wonder if I will ever need to buy anything again..... well, after I buy back the car, maybe..... Every day I was looking here, I just didn't want to miss anything. And I want to thank the people at DAZ who helped when I had a problem... they are angles. I didn't know there were freebies from Vendors, though..... am I right in that? If so could someone please direct me toward that. Here we are in the first day of 2013 and I am all bought out. There was a lot of generosity in the other stores also, God bless them. And to everyone, Happy New Year, good health, peace, and blessings. All the freebies are in this thread. Start at the fist post and go through page by page. The link to the freebies are in the posts decsribing them (starting with the first post). Holiday Hair isn't just for Christmas! Here it is on Gregoria Hair (a great product, by the way). 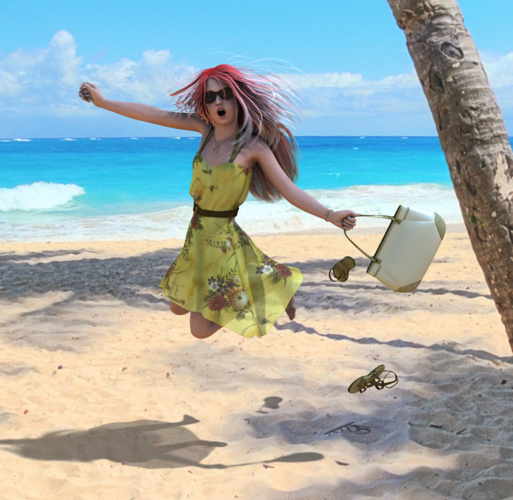 The background is Tropical Beach from HDRLabs. Thanks for sharing your render barbult. I'm glad you find the shaders useful. Thank you! Great Holiday collection of freebies! Yes! I'm still enjoying last years gifts. Oh it is so exciting. Christmas is coming! What things are going to be seen tomorrow! DAZ are hosting them for us this year! Some items will be free for a limited time only (they were intended full commercial products but those PAs wanted to participate in freebies SOMEHOW this year, so a limited time freebie was the compromise!) while some items are your regular permanent freebie. I believe either DestinysGarden or DAZ_J will be hosting this year so keep an eye out for the official xmas countdown thread 2013. That is one heck of a way to start off! A free figure! Thank you very much to the PAs who donated this! Great way to start this, thanks to the PAs doing this, and a male figure, double woho!